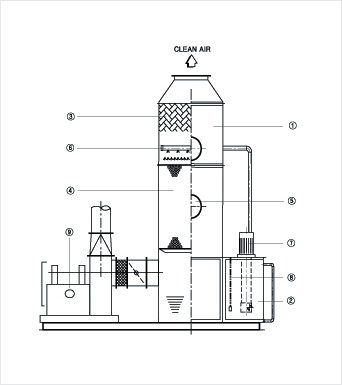 AIR TECH21 is a manufacturer of two-stage electric dust collectors. 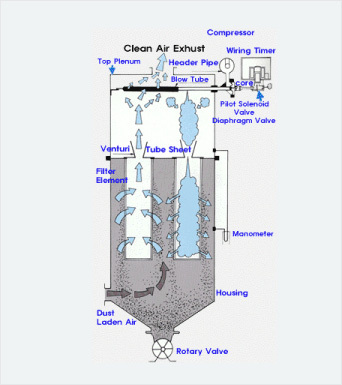 In this facility, the air contains dust inhaled by blower, then the dust attached tosurface of filter and accumulate, the filtered air exhausts through upper part. At htis time, the dust attached into surface of filter gathered through bottom rotary valve after shake off due to pulse-air jet system at regular intervals. It is definitely superior collecting efficiency and stability continuous operating. In addition, it is possible to handle multiple ways of wind pressure at rapid filtering velocity. The filter has nonwoven fabric rather than using other fabric like other company, so it has twice faster speed to filtering. Compact design even makes easier for indoor use (minimize setup area). 6. Produce many different products. This collector equipped liquid form, water shield, and bubble to wash harmful exhaust fume to separate particle from inflow gas. This facility has ability to manage and collect more than 95% harmful gases, such as dust, Hcl, HF, NH3, and Cl2. It is possible to management of variety harmful gases and dusts. It is excellent about collector efficiency of most delicate a corpuscles. Easy to operate, possible to operate continuously, Low effect of temperature of polluted substances, humid, kinds of gas. This device absorbs and removes toxic gas and offensive odors through physicochemical means. A strong traction force is created by atoms that are free of defects on solid surfaces consisting of a molecular layer and a chemical defect that is unique to gas. This force in turn absorbs gas. The device processes 1㎥/min or more gas and the efficiency rate averages 80% even though this number varies depending on the composition of the gas.